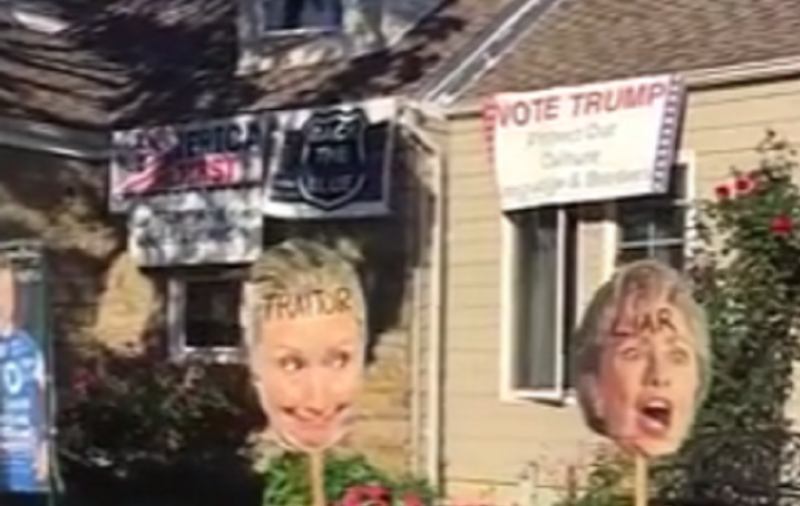 A New Yorker with extremely strong opinions on this year’s presidential election has gone all out, turning their home into a Hillary Clinton house of horror. As elections always fall just before Halloween, it is common to see political junkies festively display their views with their Jack-o-Lanterns and costumes. “Trumpkins” and costumes of Clinton in orange jumpsuits are currently a huge trend for the 2016 season. Most don’t go as all-out as this person has, however. A home in Bellmore has gone viral after a passerby named Brian McKibbin filmed the yard and posted it to social media. The footage has been shared over 11,000 times, and has received over 6,000 comments. Viewers reactions vary between being in awe and agreement — to being outright offended. “Just in time for Halloween! You’d get shot for trespassing if you trick or treated there,” a user named Matthew Davies commented. “That’s the scariest haunted house I’ve ever seen,” a Facebook user named Christian Rees lamented. On the other side of the lawn, there are American flags and giant lettering that reads “Trump USA,” painted with the stars and stripes. Naturally, people who cannot stand views that do not line up with their own have taken to the comments to claim that they would call the police if their was in their neighborhood — or worse. “This house needs to be set on fire,” a woman named Belle Leal wrote, urging arson. Agree with the homeowner or not, this is certainly one way to have the scariest house on the block for Halloween, while also exercising your First Amendment rights to their fullest potential.